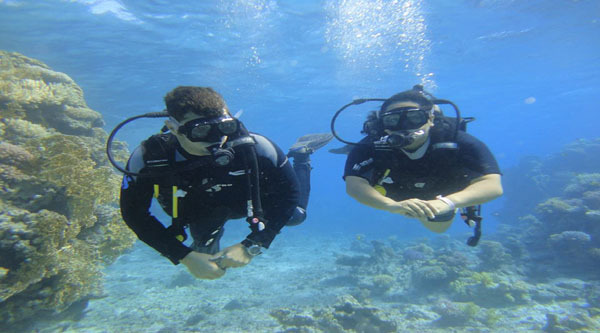 Red Sea introductory scuba trips from Sharm el Sheikh resorts. 07:30 am Pick up from your hotel and transfer to the center. Transfers by a/c car to the jetty and back. Full day boat trip with lunch and drinks. Professional English speaking diving instructor. We pick up from any hotel in Sharm el Sheikh. Pick up from your hotel in the morning and drive to the jetty where our crew will be waiting for you. Our professional dive master instructor will give you the basic knowledge in your language (how to use the scuba equipment, how to breath under the water, what to do in the case of emergency). Accessible only by boat, the Straits of Tiran and Tiran Islands guard the entrance to the Gulf of Aqaba. They consist of three islands and a series of coral reefs, all interesting areas to dive. The reefs can be reached by day boat from Na'ama Bay, while the islands generally require an overnight trip. However, because of political tensions between Egypt and Saudi Arabia, the islands are sometimes declared off limits to divers. Check at our dive center for the current status. You can do either one or two dives. 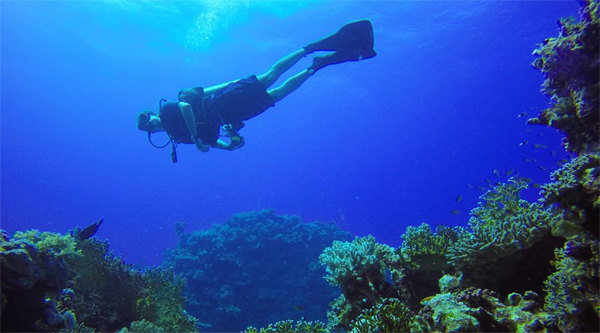 Enjoy with our professional guide the warm waters of the Red Sea. Discover colorful fish and tropical reefs of the Red sea. The 1st dive can take from 30 to 45 min depending on you air consumption. 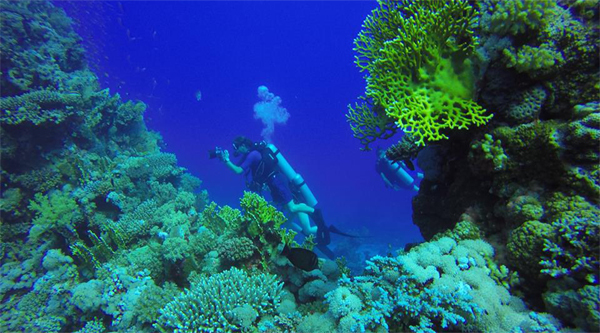 A famous coral reef at Tiran island is CORAL GARDENS. It drops to a 40 foot sand bottom with large coral clumps, one of which reaches the surface. The remains of an ancient fishing boat, about 500 years old, are embedded in the sand. Small bits of pottery and a wooden keel, heavily overgrown, can still be seen. Crocodile fish, blue spotted stingrays and morays live among the outcrops, while eagle rays, turtles and Napoleons often swim by. This area is protected from currents, and is also a good site for night diving. It is a big flat formation, is usually done as an afternoon dive because of its shallow area. The reef top is protected from currents, so topography is dominated by small outcrops and table corals. Look for small gray morays in crevices. Occasional sharks may swim through the area. Cargo from a 1950s shipwreck is scattered about the reef. On the east side, the maximum depth is 65 feet at the edge of the drop off, while the southern end slopes gently to only 30 feet some 50 yards from the reef. The east side offers better scenery. This is a good night dive when there is no wind. By 5 pm we will be back to Sharm el Sheikh jetty from where you will be transferred back to your hotel. Our next trip with the guys was intro to diving. The pick and drop off were great, waiting to board the boat was a little hectic but one on board the day was great! And such good value for money, a full day on the boat, dives and lunch! Mark has his Advance Open Water PADI but came on the intro day to be with me. The instructors were great and let him dive alongside us and for longer than me so we both got hat we wanted out of it. Again a great lunch and good company! Did the mixed introduction dive and/or snorkel boat trip to Tiran Island. 20 divers had plenty of dive guides and were taken in small groups. We had Shareef the 8 of us snorkeling and he was excellent. We had enough time at the 3 sites, and there was no confusion with everyone getting into the water together, as the dives were only 15 minutes per group. The second dive wasn't fully subscribed, and was a 'drift dive' in a slow current. We did a drift snorkel which was pleasant, near the oil tanker wreck. The last snorkel was best, just east of Naama bay. The were coral arches and enclosures. 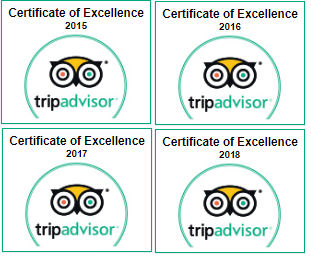 For the intro scuba dive on Tiran island sharm club takes you to their diving and snorkeling centre in naama bay then out on their boats, pick up and all admin went smooth and all the staff were great, the red sea was amazing, again, the guides were fantastic, so friendly, helpful and informative. The reefs are truly beautiful, especially the one with the Russian boat wreck, absolutely stunning!